young couple were on their honeymoon. 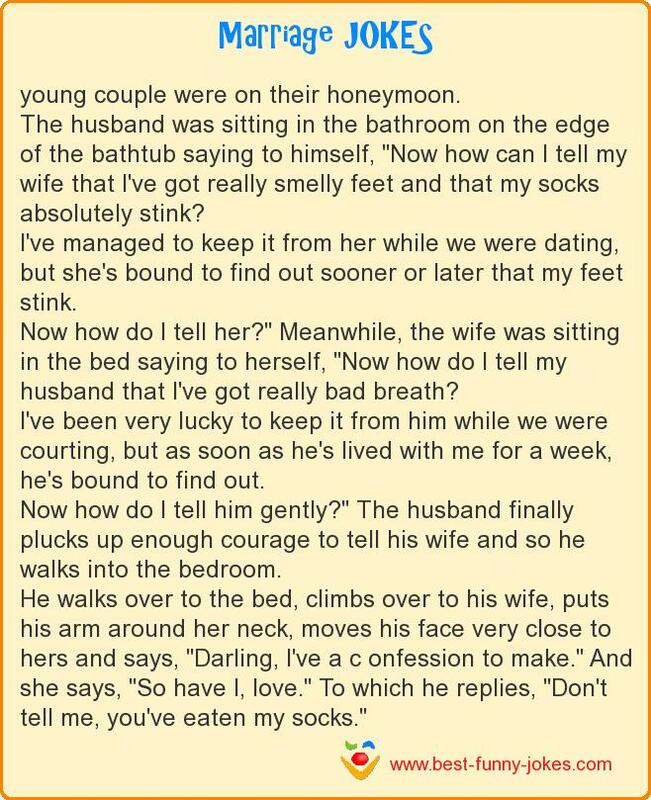 The husband was sitting in the bathroom on the edge of the bathtub saying to himself, "Now how can I tell my wife that I've got really smelly feet and that my socks absolutely stink? I've managed to keep it from her while we were dating, but she's bound to find out sooner or later that my feet stink. Now how do I tell her?" Meanwhile, the wife was sitting in the bed saying to herself, "Now how do I tell my husband that I've got really bad breath? I've been very lucky to keep it from him while we were courting, but as soon as he's lived with me for a week, he's bound to find out. Now how do I tell him gently?" The husband finally plucks up enough courage to tell his wife and so he walks into the bedroom. He walks over to the bed, climbs over to his wife, puts his arm around her neck, moves his face very close to hers and says, "Darling, I've a c onfession to make." And she says, "So have I, love." To which he replies, "Don't tell me, you've eaten my socks."